Dave Lieberman tried listening to the Yarra Yering, but still ranked it only in 5th place. 8th Place: McALISTER 1999 "The McAlister"
The consensus on "The McAlister" is "The McLoser." Adjectives used by panel members included "rotting vegetables," "mushrooms...off aromas...," "green bell peppers," "Mexican corn" and "Indian spices; kind of strange, but I found a note of cardamom." I found a wine lacking color, much akin to the appearance of wines made of Pinot Noir! I described the aromas as being reminiscent of green beans, with herbal notes. The fruit is rather tired and stale, though (for some reason) the tannin level is inappropriately high. This has nowhere to go. It is a prime example of a winery undermining the "trust" it may have had with consumers. It is hardly a "first label" wine and isn't much of a second label wine, either. 7th Place: MOUNT MARY 1999 "Quintet"
Described by one taster as having a "generous bouquet, this is really lean on the palate and disappears very quickly, having a short finish." 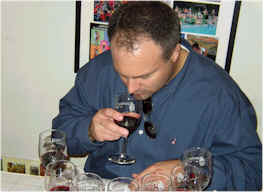 Other tasters agreed it is rather "flat", being low in acidity. One person described it as "soft and unfocussed...it's a pleasant, but small wine." Someone else found it to be "simple, with hints of dried sage and mint," while another taster found it "light and appley and bright...a good $5.99 wine." Upon its unveiling, one taster suggested the proprietary name be changed from "Quintet" to "Smoke & Mirrors." I found a light cassis aroma at the start, with a slightly coffee-like or mocha note. It stayed on the herbal/vegetal side of the street, though. It's a rather flat, little wine. I was sorely disappointed, after reading favorable reviews proclaiming Mount Mary to be one of the top Australian "cult wines." "Very deep, dark red. Opulent, heady aromas of cassis, chocolate, cedar, violet, vanilla. Elegant and fine, with a surprisingly powerful palate of intense small berry fruits tightly wound around fine-grained tannins. Smooth, silky, classy and complete; suggests a fine Margaux. Keep it. 96 points." I'm inclined to agree with the "keep it" suggestion. Having had some wine left-over the following day, I poured it for a gentleman who makes his living selling Italian wines. He tasted this, not knowing of its fame or pretense and pegged it as a rather pleasant "little wine that's good for pairing with a pizza." When informed of its lofty price and that his company sells this wine, he immediately grabbed his catalogue, being unable to accept its high price. Upon seeing the wholesale price, he remarked "What are these people doing, smoking crack?" A wine of controversy, some tasters questioning whether or not this bottle was tainted by its cork. There is no denying it is a large-sized wine, the only entry from a vintage other than 1999. The wine has a ton of wood to it. One taster described it as "Bourbon with color," while another person found it "Cognac-like." Others found a decidedly minty quality here, one describing it as a "peppermint toothpick." One person felt it changed considerably over the course of the tasting. "I really liked it as first," they said, "but it doesn't have the structure I expected or hoped for." Another taster found "the nose is so revolting. I refused to even taste this wine!" One lady found a note of "shellac" here, so I wondered if she thought it had "a nice finish." My notes describe this as peppermint, through and through, with a slightly corky or cellar smell. There's sandalwood, cedar and dusty notes here, too. I give it credit for being a stylish and impressive wine...but prefer to taste another bottle to see if that cellar note remains or if this bottle was flawed slightly. "This is seriously defective wine, being volatile and more reminiscent of salad dressing." said one taster. Another person (a doctor, coincidentally) found "band-aid aromas with a medicinal taste." Someone found "Young, sweet fruit notes, with a long and complex finish." Another fan found "the best knit aromas, combining black raspberry, licorice, bitter chocolate and tons of cherries." I found woodsy notes up front, with hints of caramel on the nose. It's mildly tannic and of medium intensity but lacks enough fruit on the palate to be anything more than a very short-term cellar candidate. One of the vegetarian tasters detected "green, vegetal notes here, being reminiscent of canned green peas and asparagus." Another taster encountered "bad, flat soda," while someone more viticulturally-minded felt there might have been some "shot berries" in the mix. "When some grapes shatter in their youth, they contribute a vegetal, unripe character along with the red, ripe fruit notes. It's got tart red berry notes and green herbal notes." Someone else felt this wine was "perhaps over-oaked as it relies too much on the wood." I found the woodsy notes here along with some red fruit aromas. It's perhaps the best Yarra Yering "No. 1" I've tasted, some being more vegetal and green-tasting. Of course, it does come from a cooler-climate region. There's plenty of acidity here and it's moderately tannic, too. I like the ripe red fruit on the palate, but don't find it to be especially plump. One star (three star scale, zero being average or standard quality). It might be cellared for another 5-8 years. 3rd Place: CULLEN 1999 "Diana Madeline"
"Flat, low acid, hollow and short." said one critic. Another person found it to have a "chalky aftertaste." Someone else found it "overly extracted and a bit over the top." One lady found "smoky, tobacco, cigar box notes, with a nice, silky texture and yet with a bitter, black olive component and some lemon zest sharpness...it's got a bitter finish, too." Another taster described the wine as "subtle, with more tannins and a nice balance of fruit and oak...better than most." Someone else found "a dark color, with wonderful aromas but it falls off too quickly on the palate." I was entranced by the nose, finding a bit of mint and menthol, with lots of woodsy notes, too. It's big and intense, without having much generosity on the palate as a result of its tannin. It ends up being more sharp, astringent and powerful, rather than having grace or elegance. Five to ten years' worth of cellaring time, I pegged this as a "one-and-a-half star" wine. 2nd Place: PARKER ESTATES 1999 "Terra Rossa"
One taster gave this credit for "being recognizable as a Cabernet." 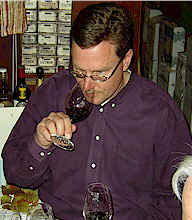 Another enjoyed the fruit/oak balance and found "it tasted better than I expected based on the nose." Someone else felt it might be "closed in, with some cassis-like fruit. It's low in acidity, yet very tannic, co the finish is sour." Another critic found it "tight on the nose, with hints of cassis and blueberry, but weak mid-palate and it's extremely tannic." Someone else felt it had "too much extraction, giving it a sour feel." Someone derided this for calling itself a "First Growth." I thought the nose was very intriguing and complex, showing ripe fruit with plums and berries framed by some sweet oak. The same elements arrive on the palate, encased in plenty of tannin and astringency. Five to eight years of cellaring may tame some of the tannins. One star. 1st Place: D'ARENBERG 1999 "The Coppermine Road"
"It's more styled like a California Zinfandel!" said one fellow. Another taster found "raspberry jam, cranberries, orange peel, caramel and butterscotch...it's way over the top!" A third person found it "approachable," while someone else found it to have "ripe fruit with some spice, but it's harsh and alcoholic." 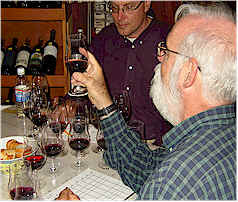 A couple of other tasters agreed on the wine being "bitingly harsh." Another person felt it had "the best aromas, with some herbal fruit and spicy oak and a note of eucalyptus." Bob said he detected a note of "wormwood." I found the nice oak here, but, along with hints of violets, felt the wine had too much of a raspberry jam element on the nose. The jammy notes make for a sweet and somewhat flat quality on the palate, yet there's a hard, tough exterior for all that soft and ripe fruit. 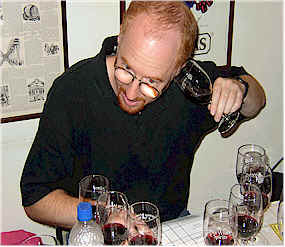 Overall, I felt the wine was a bit too shallow and not especially complex.